This guide is nearly a decade old, and mostly a decade out-of-date. While it does allow you to run Day of the Tentacle, a DOS game, on Windows XP, it's a bit complicated. I strongly recommend anyone trying to run DOTT on a modern Windows install, or on Linux or MacOS-X, to use ScummVM instead. This is a guide to running Lucasarts' awesome adventure game Day of the Tentacle ("DOTT") on a Windows XP machine. You can find the original CD for DOTT in second-hand stores, and Lucasarts has released it on CD and (I believe) on DVD-ROM - but in all cases they've not updated it to run on Windows, and it generally needs some coaxing to work properly. These instructions show how to do this on Windows XP, but should (I've not tested) also apply to Windows2000. Windows XP does a pretty good job of emulating a ten-year old DOS platform, at least as far as gameplay and graphics go, but it doesn't do a good job emulating the antique sound hardware of that era. Luckily Vlad Romascanu was written the excellent VDMSound system, which emulates the SoundBlaster and MIDI hardware that DOTT needs. Download VDMSound and install it. 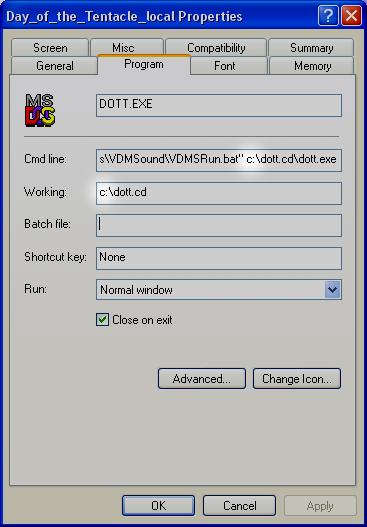 Note that the current version of VDMsound is 2.1.0 beta - I can't get DoTT's music to work with it. Everything works fine with version 2.0.4, so please use that version. 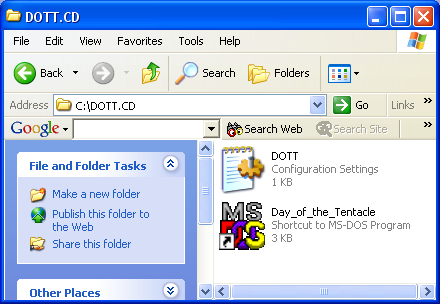 Create a directory called c:\dott.cd. Download this zip file and unpack it into that directory. Edit the properties of the shortcut (above) to match your installation. 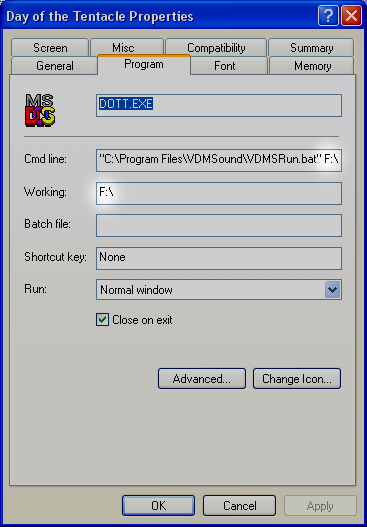 You need to ensure that the Cmd Line property (on the Program tab) contains the correct value for the location of VDMSound, and make sure that the correct drive letter of your CD-ROM drive is set. Double-click the Day_of_the_Tentacle shortcut to play the game. You will experience one small problem with the game - occasionally the game will appear to hang after one of the characters has said something - just press the . (period) key, and the game will continue as normal. We're not out of the woods yet. If, with the above configuration, you try to save the game, DOTT will fail to do so - it's trying to save to the "current drive", which is the CD. I've not figured out a straightforward fix for this, as the DOTT executable also looks in that same current drive for game files. 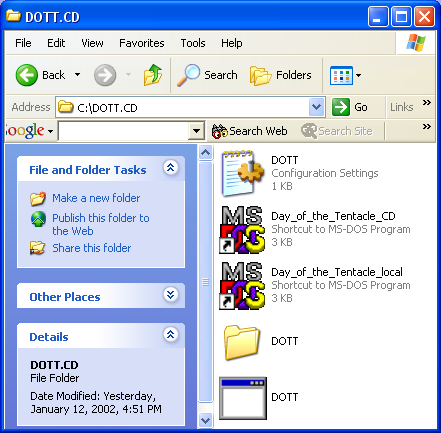 Savegames are stored in the C:\DOTT.CD\DOTT directory. The only downside is that the entire contents of the CD are now on a local drive (that's around 270 megabytes). Vlad Romascanu wrote VDMSound, which is really a spectacular effort. Vlad also figured out the tweak to DOTT.INI, and how to unfreeze the game by pressing the period key. This page is Copyright © 2002-2011 by W.Finlay McWalter.